Web security is more important than ever. 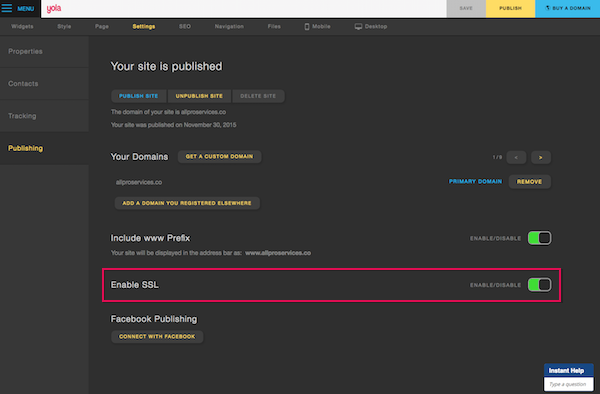 With this in mind, The Yola Team is excited to announce our newest feature: SSL Protection for all users. What is SSL protection and why does it matter? SSL establishes an encrypted link between a web server and a browser, ensuring that all data transferred remains private. It allows you to protect site visitors’ data from monitoring and tampering while they browse your website, purchase products and fill out contact forms. Customer trust: In having an SSL certificate, the domain name of your business website will display with “HTTPS” rather than “HTTP” as well as a lock icon. This gives your customers peace of mind while browsing your website. It also shows that you value their security, boosting your credibility. Search engine ranking: The Yola Team isn’t the only one aiming for a secure web. Google released an algorithm which gives secure sites an additional boost in search engine rankings. How do I add SSL protection to my website? *Note, users with sub-domains can choose to Enable SSL or “Include www Prefix.” Users with a custom domain name have no restrictions. And with one click, your site is secure. Put your customers’ minds at ease and add SSL protection to your business website today! Announcing the Yola Web Stars Contest! Has anyone notice a drop in traffic since changing to HTTPS ? Thank you for the feedback! The redirect to HTTPS can result in a temporary loss in traffic – in the same way any other redirect does. I see you were assisted by our Support team as well. We will definitely look into a more detailed explanation of what to expect when enabling SSL. Cannot be used with pointed domains -Therefore this is not available to all Yola users ! Yes, I hope this is somehow rectified soon. If a domain is not hosted by Yola, we are not able to enable the SSL feature as this is an option which is set within the domain hosts environment. Thank you for pointing this out, Jon! SSL is a feature offered by Yola on all domains purchased and registered with us. If you have a domain with another host, you will need to reach out to them to see if they can enable this feature for you within their hosting environment. If your domain host is unable to assist, you can always transfer your domain to Yola which will allow you to use our SSL feature. We do not offer support in the Indonesian language. If you do not speak or write one of these languages, please use Google Translate. We look forward to hearing from you again to assist with any questions you may have! Jika Anda tidak berbicara atau menulis salah satu bahasa tersebut , silakan gunakan Google Translate . Kami berharap untuk mendengar dari Anda lagi untuk membantu dengan pertanyaan yang mungkin Anda miliki ! I purchased my domain through Yola, but the settings page of sitebuilder says I have a pointed domain. I don’t know how to contact the host, except through Yola. In order to assist you with your inquiry it would be best to send us an email using the email address you to login at yola.com. This way we can locate and access your account immediately and see all of your services and settings, including your domain subscription details. Please also let us know the name of the domain you are referring to. We look forward to your email to assist further! Well you should be thanking CloudFlare really, because that is where the SSL certificates come from. In addition, anyone can obtain a secure website with them. We are very thankful to our partnership with Cloudflare. While it is true that anyone can obtain a secure website with them, our Yola users don’t need to worry about the set up as we seamlessly integrate the SSL feature directly into the Sitebuilder, making it easy to enable or disable the SSL feature. I enable the ssl certificates but right know in google webmaster tool verification failed error shows and disable option also not worked in my yola account. Please send us an email to support@yola.com from your login email address and we would be happy to assist you further.